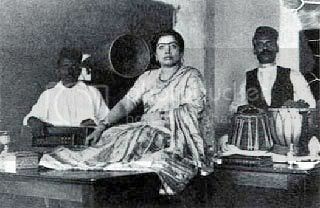 History will always remember that the first gramophone record in India was cut in 1902 and the singer was Gauhar Jan. It is believed that very few women, during those early days, ventured into recording. It was Gauhar Jan, an artist of considerable repute, who broke this taboo. 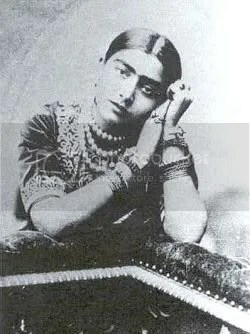 She was called the Gramophone Girl and in some of the later records she was described as the Dancing Girl of Calcutta. That first record of hers turned a best seller. Thereafter, during 1902-1910, some 500 artists made recordings for the Gramophone Company. One of them was a teenage dancing girl called Achhan Bai. Here I present to you some songs recorded by her, which I presume are the only ones left preserved. Take note of the announcements in first three songs. Preserving these 78rpm discs were always cumbersome and so naturally, even the Gramophone Company of India, that held monopoly over recordings for a long while, dispensed with most of their collections. Many people even painted on these discs and used them as wall decorations, while others moulded them into shapes that could be used as Paan daan (betel leaf box). These boxes were sold for one Rupee, while the 78rpm record cost just four annas (16 paise). Then, there were these businessmen from Bombay who reportedly bought all the 78rpms they could from the market and even from private collectors, on the pretext that they were attempting to save those ancient recordings through some modern technology. It was just after the World War, and there was restriction on the import of lac or shellac, which these shrewd businessmen knew, would be in short supply. The 78rpm gramophone records were made of high quality, purified lac. All the piles of records they gathered were then melted to obtain this substance. And thus was lost precious music and documented history. Rising from the ruins, some gems from the past will, however, continue to surface, thanks to a few passionate collectors living unrecognized in several parts of India. The first ever Indian voice was recorded by Fred Gaisberg in London in February 1899. These were 7 inch records with recording on one side only. Some 44 recordings, were made in Hindi, Urdu, Bengali and Punjabi. None of these records have been found by the collectors. In 1900 the population of India was approximately 234 million. The inhabitants spoke more than twenty different languages and hundreds of dialects, and had a musical culture reaching back several thousand years. This potential market led to three major recording tours by Gramophone Company experts between 1902 and 1908, led by Fred Gaisberg, William Sinkler Darby, and Will Gaisberg. On November 14, 1902, the first recording of Hindustani classical music was engraved in the grooves of a gramophone record. A very rudimentary and makeshift recording studio had been set up in two large rooms of a hotel in Calcutta by the Gramophone Company. Gaisberg visited several theaters, attended mehfils at wealthy Jamindars‘ palaces, and thus found at least one promising artist to begin with. The artist was a very famous dancing girl, although her voice was not so sweet for European ears. She agreed to a recording session for the handsome fee of Rs. 3,000. Her name was Gauhar Jan. In the beginning around 1902, many artists recorded songs in Calcutta. The artists were either ‘Nautch Girls‘ (dancing girls) or women under the patronage of kings and wealthy landlords. They belonged to Agra, Lucknow, Allahabad, Benares, Calcutta, and Delhi. 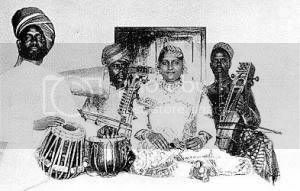 Later on celebrity dancing girls like Janki Bai of Allahabad, Zohra Bai of Agra, Malka Jan of Agra recorded prolifically for the company. During 1902-1908, recordings of over 8-10 very famous artists helped in establishing the business in India. However, these are almost forgotten now. Here is an attempt to acknowledge these noted female singers of that period. The songs may not be good examples of the art of classical singing, but are of historic importance. In order to have recorded documentation for making paper labels, the artists were asked to announce their names in English at the end of singing. This helped the technicians in Germany in making the final records ready for sale. All the songs posted above have the announcement at the end. This continued for two more recording expeditions and about 3000 wax records were made, pressed in Germany and brought back to India for marketing.